Revitalize patios, outdoor cafes and picnic areas while maximizing your guests' safety, accessibility and enjoyment with these single pedestal 46" round picnic tables. The classic styling of this expanded steel table is engineered to deliver top structural integrity with the state-of-the-art, all-weather, maintenance-free finishing. The main pedestal column is constructed with 4" x 4" powder-coated commercial grade square steel tube supporting the table top, 2-7/8"O.D. extension arms, the seat bench	and tons of fun. 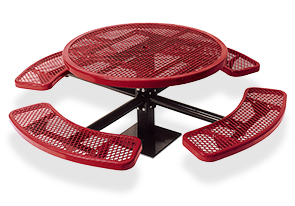 This round diamond pattern, expanded steel table is a great addition for safe and reliable year round seating in public areas. Two, three and four ADA compliant bench seat models are available.